Institut Esthederm’s suncare products protect youthfulness and can change your skin’s fate when it comes to sun exposure. Since its foundation, Institut Esthederm has focused its research on exploring how the skin interacts with the sun. Its research has enabled major scientific breakthroughs which now mean that Esthederm’s sun protection products are some of the most highly effective youth-preserving products on the market. More than mere sun protection, these products embody a certain way of living in the sun, a unique pleasure, reserved to the lucky few. convictions ran counter to traditional thinking: no life without sun. There is no life without sun, because humans were born under it. the skin’s resistance to UV rays. ADAPT TO THE SUN INSTEAD OF OVERPROTECTING THE SKIN. of sun is needed to trigger an amazing protection mechanism: tanning. THE SKIN PROTECTS ITSELF BY TANNING. the surface of the skin thickens to better filter solar radiation. Tanning is the sunburn’s protective mechanism. When exposed to too much sun, the skin’s natural defences reach their saturation point and need to be optimized. That’s why the “GLOBAL CELLULAR PROTECTION” patent was created. the level of UVB protection (responsible for causing sunburn). product depending on the intensity of the sun. At the heart of every Esthederm suncare product is the patented technology Global Cellular Protection, which protects the quality and youthfulness of the skin in the sun by neutralising photo-ageing. Protection against oxidative stress, responsible for accelerated ageing: wrinkles, loss of firmness (in vitro test). nti-inflammatory protection, to shield the skin against inflammaging and pigment spots (UVA + UVB ex vivo tests, prevention of sunburn cells, TNF-α and PGE2). Protection from dermal deterioration by preventing the synthesis of MMP-1, responsible for the degradation of collagen fibres (test on full light spectrum). Protection against DNA damage, the cause of changes to cellular genetic material (new H2Ax, in vitro, UVA test. 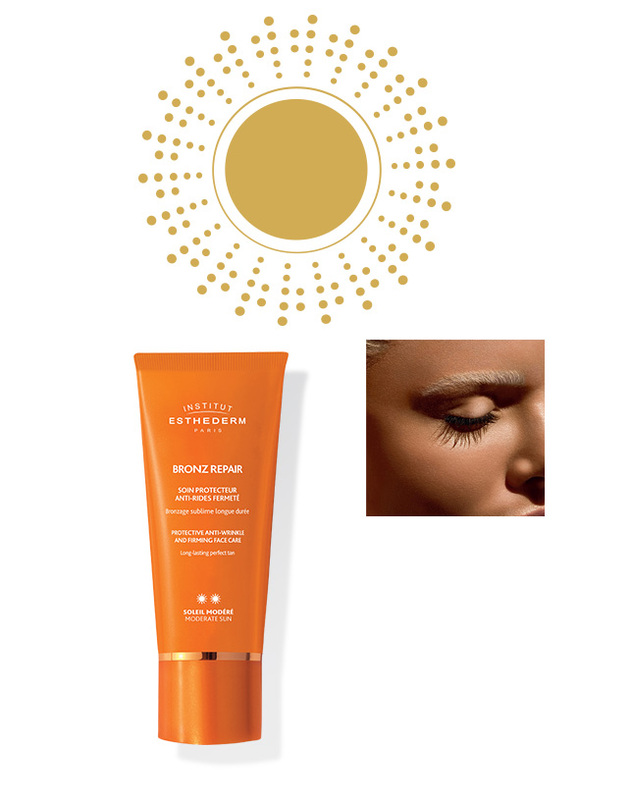 UVA/UVB protection that’s three times higher than the recommendations of suncare products for the face Bronz Repair. Balanced protection: prevents sunburn and optimises the tanning process with self tanner Sun Sheen.